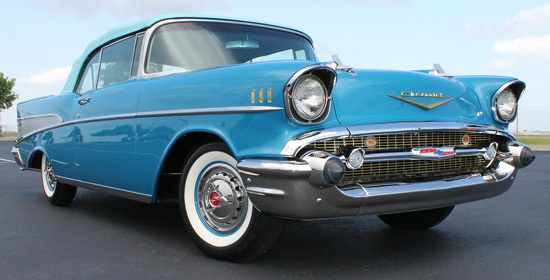 This incredible ’57 Bel Air is a 998 point Platinum award winner. What does a high school reunion picnic have to do with classic cars? Well, read on. A few years ago, maybe even longer (because we all know how fast time flies), I mentioned to my good friend, Roy Reichenbach, that I might be interested in a 1957 Chevrolet convertible. Everyone that has, or has had a classic Chevy knows who Roy is. I received a phone call from Roy in early May of 2008, asking me if I was still interested. I said, “Roy, you have caught me at a bad time.” I had just repurchased the 1967 Impala SS two-door hardtop that I’d bought new from Wilkerson Chevrolet in Tulsa, OK, on June 6th of 1967. Roy said he had seen this ’57 convertible that had been restored by Jeff Steinmetz Restorations. However, he said he didn’t pick the car apart (so to speak), but it was very straight, the fit was good and it was a very beautiful Harbor Blue convertible with original factory air. My first thought was; it isn’t red! Every vehicle I own is red, or at least some shade of red, so I just didn’t know how Harbor Blue would fit in. I asked Roy where this convertible was located; he said in Lancaster, OH. 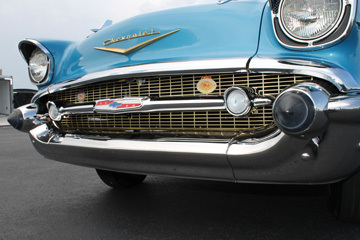 The car was in the process of being restored for a Mr. Gary Young when Mr. Young passed away. His widow then had Jeff Steinmetz Restorations complete the work. This is where my 1951 high school reunion picnic got expensive. My class picnic was in Wellston, OH (which is only 50 miles from Lancaster), just two weeks following Roy’s phone call. Of course, I had to go look at the car. It was at the residence of Mrs. Young. As I drove up the long driveway to the house, there sat this, I will have to admit, beautiful Harbor Blue convertible with a light blue top. I looked the car over and without taking too much of Jeff Steinmetz’s time, I asked how long I had to decide on taking the car. He said he would hold it for one week and at the end of that time, he would like to have a yes or no. This was on a Sunday. I thought that was very fair, so my wife and I started back to Oklahoma. I don’t think it’s hard to imagine what most of the conversation was about on that trip home. I think the decision was about made by the time we got back on that Monday. By Wednesday, we were on our way up to Ohio again, this time to get the Bel Air. Without doing one thing to the car, we took it to Chevy Classics’ 2008 Western National in Albuquerque, NM, where it scored 987 points and earned a Platinum Certificate. We all know that no matter how nice your car is, we all strive to make it better. 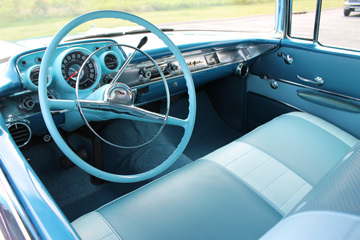 The Bel Air did have a few minor issues with the interior and the top had a couple of things that needed attention. The carpet needed to be changed because of the color, and the upholstery needed to be tightened up a bit. The top also had a few wrinkles that needed to be taken out. Most of the Eckler’s Club members who knew about convertible tops said I had to take the car to Ed Limanen in Brooklyn Center, MN, to have it taken care of. Since I wanted the best “top” man I could find, I loaded the car in my trailer and was off on a 675 mile, 11 hour trip to Minnesota. My wife and I spent the weekend in a motel while Ed worked on the top. Ed and his wife have since passed away; they were wonderful people. The interior was taken care of by John Fisher of Speed Craft Interiors in Owasso, OK. John and I worked together at American Airlines for over 35 years before he started his own company. 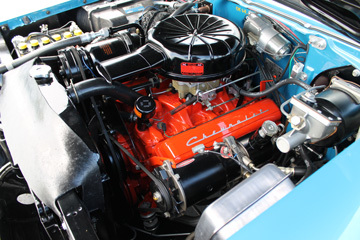 The car has a 283 engine with the Power Pack, power steering and power brakes. A couple of unique features are original factory air and a matching blue top. Since the Albuquerque show, and after fixing all the items that had been written up on the car (by show judges), it has now won the Top Award of Senior Grand National winner by the Antique Automobile Club of America. It’s also won the Editor’s Award, Gold Class Award, and Best Paint Award in the Gold Class at Super Chevy. At the Eckler’s Chevy Classics Club Show in Norman, OK, it scored 998 points. Thanks to Roy for making me aware of this car. It has been a joy to own. I guess maybe the expense of my class picnic wasn’t so bad after all!